AHDB has recently published a report, which focused on the opportunities changing diets and improving wealth present for exporters to China. China has already emerged in recent years as a significant market for UK pork and pig offal. 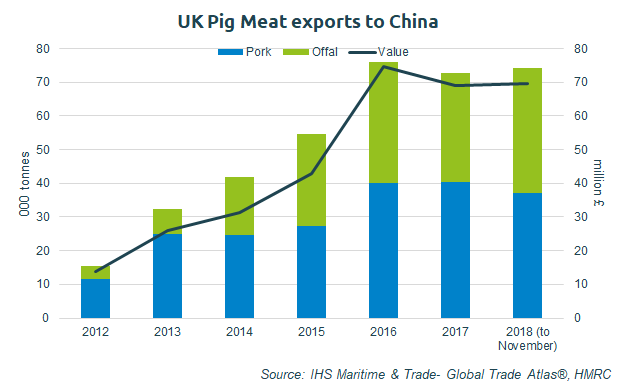 In the year to November, the UK exported 74,000 tonnes of pork and offal worth £69 million directly to China. This is approximately 23% of our export volume over the period, and 15% of the value. Within this, China is disproportionately important for UK offal exports; it is the destination for 46% of the total export volume and 41% of the total value of these products. Beth Wilkins, a market intelligence analyst at AHDB, said: “The UK produced 855,000 tonnes of pork in the year to November 2018. Looking at pork meat exports to China over this period, approximately 4% of UK pork production was exported there (not including offal). Ms Wilkins added: “The UK has only been supplying pork to mainland China since 2012. Since then, the UK presence on the Chinese market has fluctuated somewhat. UK product achieved a 3.5% market share of import volume in 2015, and this was repeated in Jan-November 2018. In value terms, the UK presence is slightly lower, but achieved a new record of 2.7% in Jan-November 2018. The developing UK presence on the Chinese market has been helped by the increasing number of businesses gaining approval to supply to China over the years. Plants must be individually inspected by the Chinese authorities in order to gain approval.